Red Dead Redemption 2 is a highly anticipated title coming to PlayStation 4 and Xbox One and the scheduled release date is a little more than a month away. Whether the title will come to PC or not seems to be rather uncertain at the moment. Today we have news to share on both these topics. Sony is preparing a trio of PS4 Red Dead Redemption 2 bundles in Europe, ahead of the game's release on 26th October. There's a mix of PS4 and PS4 Pro bundles but European pricing wasn't revealed in the official blog post. The headlining bundle is the 1TB Jet Black PS4 Pro bundle, which includes a Dualshock 4 wireless controller and Red Dead Redemption 2 on Blu-ray disc. Pre-orders start today. 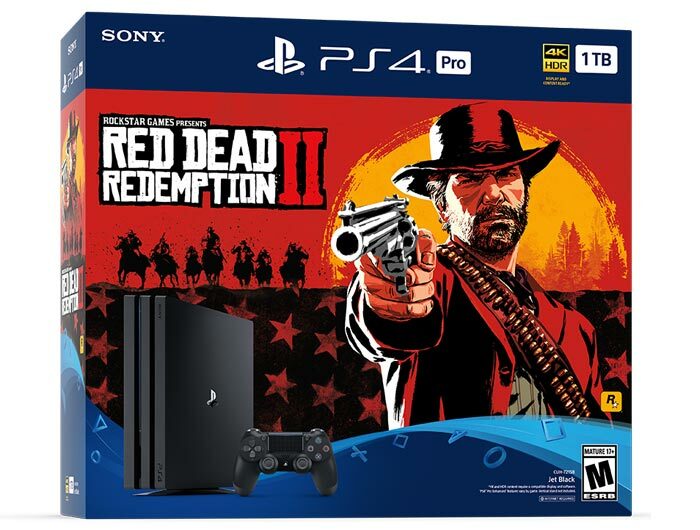 Two bundles feature the standard PS4 with a Dualshock 4 wireless controller and copy of Red Dead Redemption 2 on Blu-ray disc and vary only by installed HDD capacity (1TB and 500GB). The 500GB model, is UK only for some reason. If you choose the PS4 Pro bundle you will benefit from enhanced graphics and optimised performance for "a stunningly sharp and detailed look" on your 4K HDR TV set. The PS4 Pro's built-in supersampling feature and HDR (if available on your TV) will reap visual rewards. Meanwhile, with the standard PS4, gamers will still be able to enjoy HDR graphics. Sony says that Red Dead Redemption 2 outputs to 2160p and graphics are scaled appropriately depending upon your console/TV. We don't have European bundle prices but I spotted the US Sony blog shared the Jet Black Pro bundle cost; its $399.99 (MSRP) / $499.99 CAD (MSRP). A few days ago a developer working on Red Dead Redemption 2 was apparently mistranslated as ruling out the game's development for PC. PCGamesN got on the case and has judged that the statement from an interview at the Tokyo Games Show, indicating Red Dead Redemption 2 is "absolutely not coming to PC," was just a common-or-garden mistranslation. The correct statement translation was Red Dead Redemption 2 "is for Xbox and PS4," which doesn't rule out a PC port at a later date. Rockstar never ported the original Red Dead Redemption to PC so it wouldn't be that surprising if it stayed away from the platform. However, money talks and the latest GTA release sold 10 million copies on Steam and continues to rake in microtransactions. It did take 18 months or so for GTA V to get shovelled onto PC so it wouldn't be surprising to see a similar delay in moving Red Dead Redemption 2 to the platform. I heard the first one wasn't ported over due to data loss and it would have been too expensive to do (Don't hold me to that, it could be incorrect information but it is what I heard). The second one will most definitely come to PC as GTA: Online has made an absolute fortune through micro transactions. Take-Two would set Rockstar offices on fire if they didn't push this on PC later down the line (12 - 24 months). And yes, you can all hold me to that second one. Plus it is a lot easier to port from consoles to PC these days as they are x86 based like PC's, unlike the situation at the time of the first game when they were completely different. I really hope they do port it (and do it well). Really wanted to play the first game but never got the chance cause they didn't port it. I can wait a year to play this on PC - and I won't make the mistake of buying it multiple times like I did for GTAV (PS3, then XBONE, then PC as I slowly upgraded my gaming experiences…). I still hold out a tiny shred of hope for a remaster of the first one at some point as I never really got into it on my 360..but we'll have to wait and see!